$1,200,000 THIS HAS IT ALL! "25 ACRE ON MOIRA RIVER & ATTRACTIVE HOME"
Garage: Double, Attached "+ 1320 SQ. 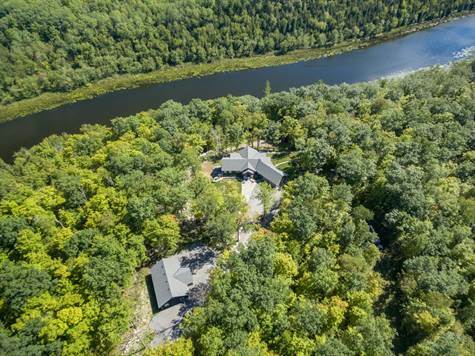 DETACHED"
Stunning waterfront property w/25 acres on Moira River,922 ft water frontage. Extremely private with an elevated view of river. Long driveway leads you to this 1991 plus sq ft on main floor bungalow with an attached insulated double garage, plus a detached 1320 sq ft garage for all your toys. Attention to detail with tongue and groove whitewashed pine ceiling with exposed beam accents, hardwood floors, cathedral ceilings and custom stone mantel with propane fireplace. Open concept K/LR/DR area includes granite counter tops and french doors to covered deck area with amazing view. 3 bedrooms on main level including master with 3 pc en-suite with walk in shower. Full basement complete with stunning rec room/bar area, 4th bedroom, 3pc bath and lower deck area. Dock includes covered boat slip and extra docking,plus a covered gazebo. Lots of great boating and fishing and swim right off the dock. Top of the line generator system to run the whole house if needed for peace of mind. A MUST SEE! !